Quest Club – THE Hottest Nightclub in Birmingham! THE Hottest Nightclub in Birmingham! Welcome to the hottest night club in the Birmingham area! 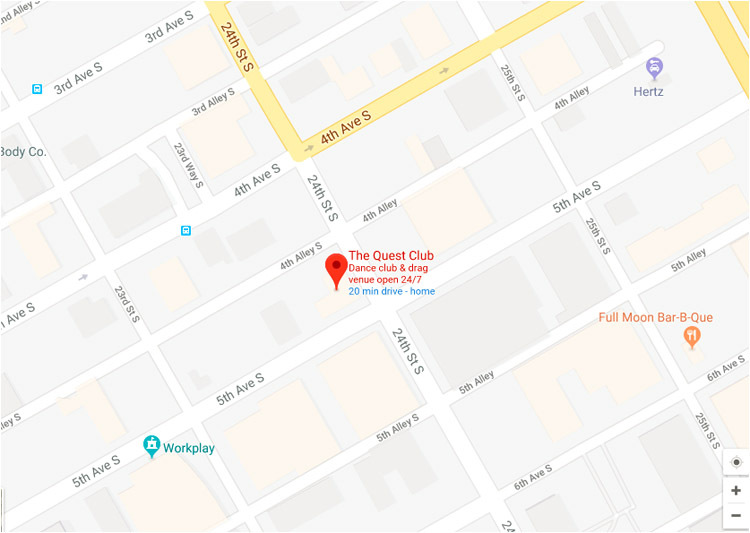 The Quest is a private club and we NEVER close! The Quest Club has an ATM machine on site. We welcome all major credit cards for your bar tabs and cover charge. 19 Years and up to party – 21 Years and up to drink – WITH VALID ID! We have a DJ Five Nights Per Week! The Quest Club has ZERO tolerance for drug use. If you are found with illegal drugs of any type you will be banned from the Quest. Prices may change with special events, Halloween and New Year’s Eve. The QUEST Club is a proud sponsor of Birmingham Aids Outreach, Central Alabama PRIDE, Magic City Wellness Center, The Southern Shootout Softball Tournament, and The Mystic Krewe of Apollo Birmingham. Peach Schnapps, Irish Cream, Blue Curacao, Splash of Grenadine! Loopy Vodka with Cranberry and Orange Juices!